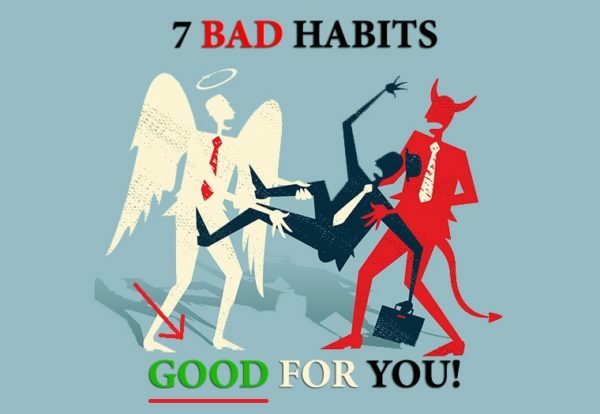 7 Bad Habits That Are ACTUALLY Good For You! It seems that nowadays, the world is focused only on what’s right. Do this, Don’t do that.. it takes away the magic of living. It’s about time we start living more consciously, there is no doubt about that. Maybe it’s necessary to be constantly reminded of what’s the right thing to do. But sometimes, the right thing to do means doing the wrong thing. When loud music is playing the brain is stimulated into release hormones that make us calm and happy. Even though it can be irritating as hell for someone else in the room, fidgeting can increase memory and creativity, and burns calories too. Sleeping can help you live longer, improve memory and reduce stress. However, overdoing with the snooze button can result in being irresponsible, late and, therefore, in more stress. It’s not always bad to snooze your alarm but play it smart. Allowing yourself the little “cheat” meal will boost your happiness. If you do this in moderation there is absolutely no harm and it can reduce future cravings. Venting your emotions reduces the effects of stress and decreases the risk of having a heart attack. It’s ok to show your emotions, you are human after all. When drunk in moderation (1-3 cups per day) caffeine can speed up metabolism, reduce stress and prevent depression. Read why coffee is probably the healthiest beverage you can drink. Spending some time under the sunshine and showering in its beauty is nothing to be feared if it’s done in moderation. It decreases Vitamin D deficiency, reduces blood pressure and cuts the risk of heart attacks. Getting a tan is a bonus.